Column: Is Jim Harbaugh's demanding ways pushing players away? First Jack Miller, now Blake Countess. Two impact players from the Michigan Wolverines have left the program since Jim Harbaugh took the reigns of the program back in December. Miller decided to leave the team to focus on school, and Countess just today announced he will transfer for his final year of eligibility. Two impact players leaving brings up the question: Is it Harbaugh? Harbaugh is known for being quite outspoken, and former players have also described him as "out of his mind." He expects the best from you, and he will push you until your breaking point to get the best. But, is his constant pushing for success also pushing away some of the returning players here? There is no such thing as a "soft" coach. There may be some players coaches in the NCAA, but there are no "soft" coaches. The closest possible thing to a coach like that would have been Brady Hoke. From the constant clapping, all the way to the fact he was never fired up on the sidelines, Hoke was a players coach. Harbaugh is not a players coach. But he will win, and he will push you to be the best. With a very very large amount of the roster all being Hoke recruits, and playing under Hoke one can only assume the players have not been pushed this hard, and been disciplined as much as they have been under Harbaugh. Some can take it, and some can't. Countess is likely the first big domino to fall prior to the arrival of new recruits this summer. One question that many have asked about Harbaughs demeanor is what will it do to recruiting? Players want to play for the best, and be the best. And if you're playing under Jim Harbaugh here at Michigan, then you will check yes in both of the above categories. 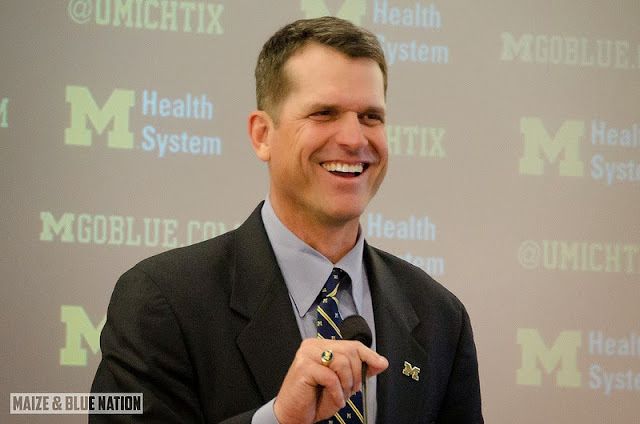 Players looking to come to Michigan may look at Harbaugh and say he is an extremely demanding and tough coach, but they also know the fast track to the NFL runs right through Ann Arbor. Right now Harbaugh is just letting the ones who can't handle it go, and if more leave then that's fine to him. He will find the right players. So while Harbaugh may be demanding, and other players may leave, there are only a few things to say. And, who's got it better than us?